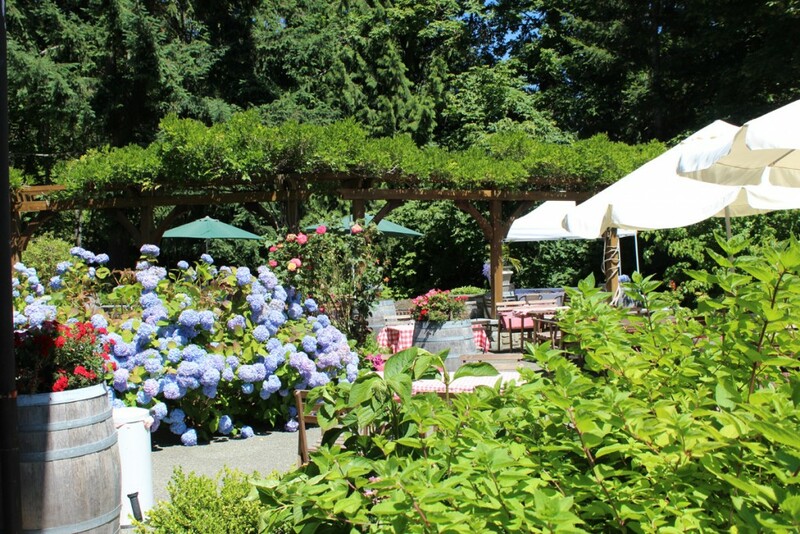 But after a visit to the Averill Creek Vineyard on Vancouver Island in June, I know a little more than I did before. Sitting along the side of Mt. 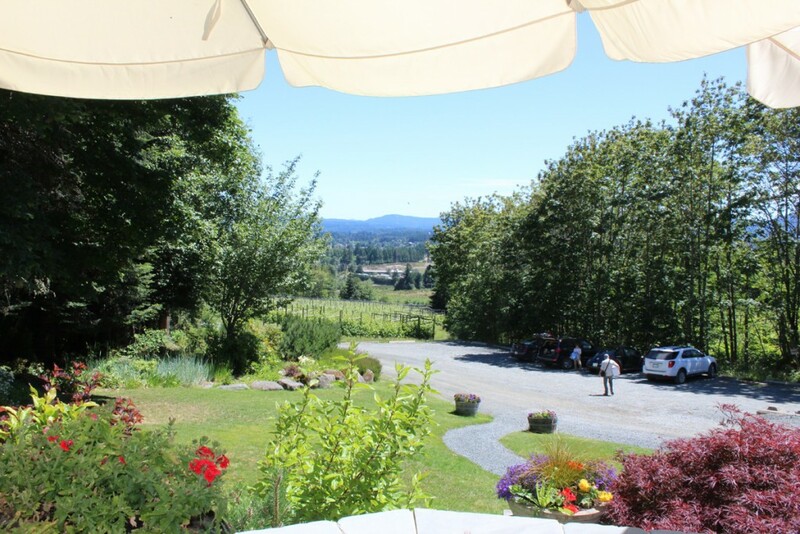 Prevost, the winery commands an excellent view of the Cowichan Valley. 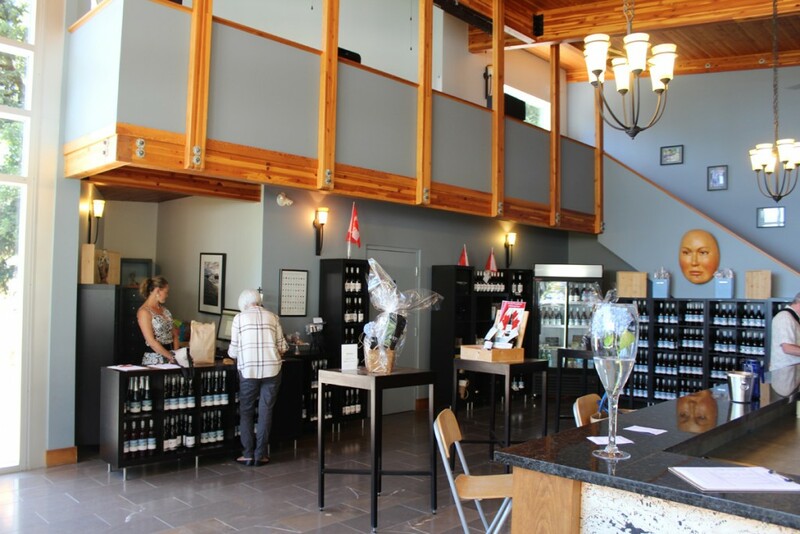 The winery is located just north of Duncan. Take Highway 1 to Cowichan Valley Highway which is also Highway 18, and head north. Turn right at N Road followed by a left at North Road which is a gravel road. There is a large sign so you should find it easily enough. It’s a windy gravel road which takes you up the mountainside to the winery. There is a gate at the entrance which is opened by entering a code on a keypad. The code is shown on a sign so it is meant to keep deer out, not people. 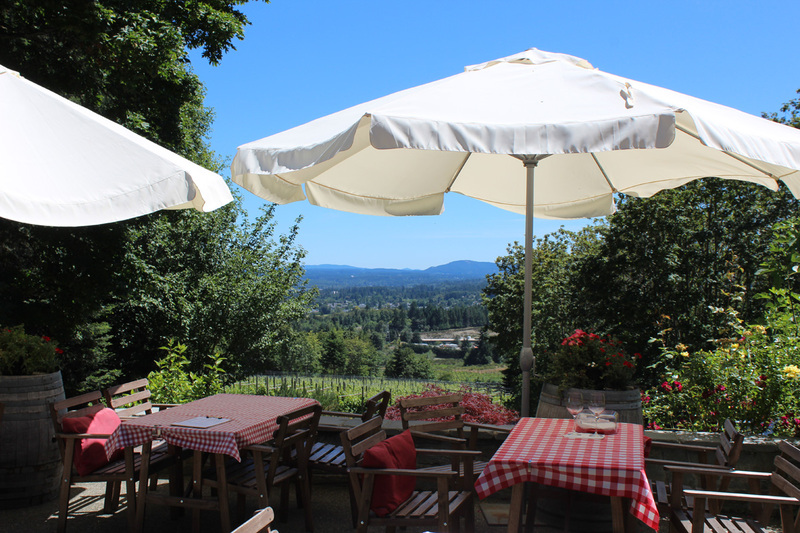 Averill Creek encompasses 32 acres of vines as well as three buildings adjacent to each other and staggered up the hillside. This allows the wines to flow from one stage to the next entirely by gravity without pumps. 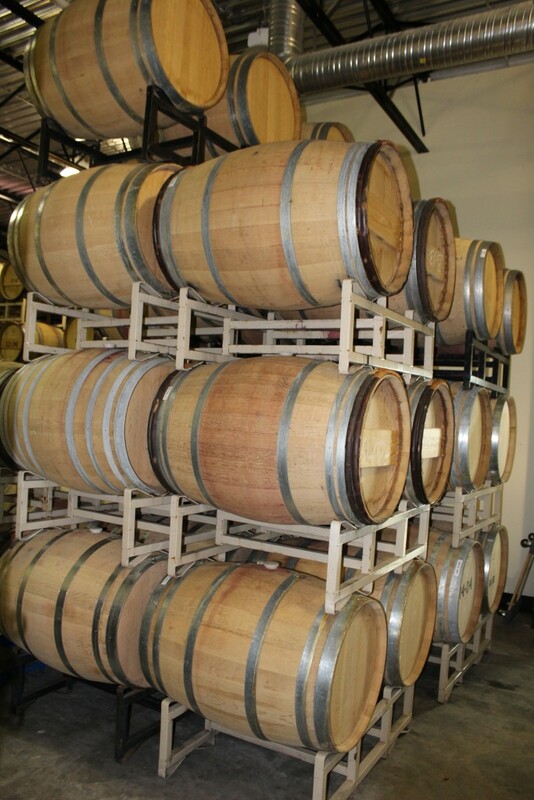 The Barrel Room – the wine arrives here by gravity – no pumping. 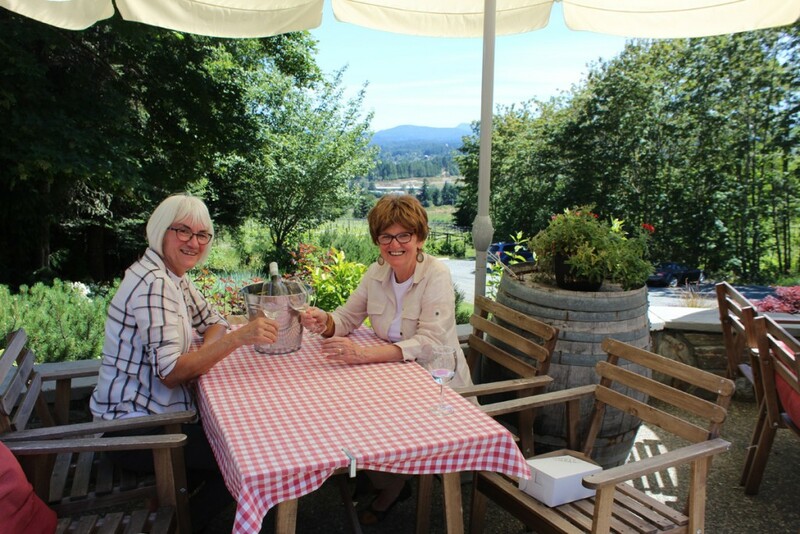 When we arrived, our charming hostess Stephanie laid out four glasses for us and we sampled our first, a nice blend of Pinot Gris and Pinot Noir called Charme de L’ile. 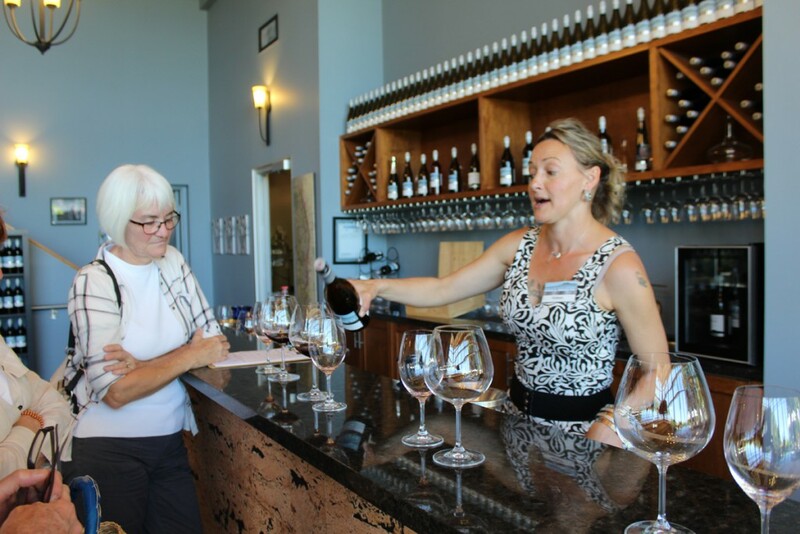 As she poured samples, Stephanie talked about the winery and the wines. 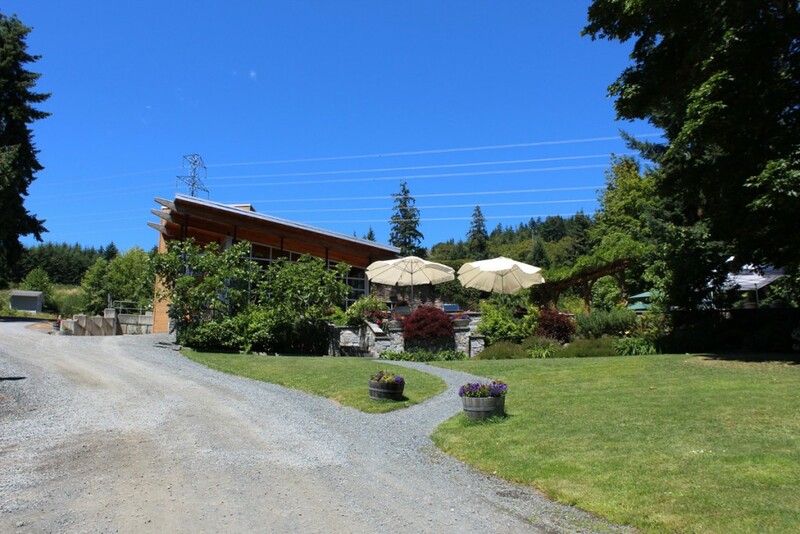 Averill Creek, she told us, was a true estate winery. All grapes used are grown on the property. None are imported. They are hand-picked and they often employ local aboriginals as pickers. As we sampled some more wines, she interrupted her talk when she noticed a hummingbird had flown in through the doorway. It was disoriented and sitting behind a wine barrel by the window. If I had known what she was going to do, I would have had my camera ready. She approached the fallen bird and rather than just shooing it out the door, she knelt down and gently picked it up in her hands, walked outside and let it go. Bird whisperer! Now Stephanie brought out four more glasses, larger, wider glasses. Snifters specially designed to drink Pinot Noir. Stephanie pours some pinot noir into the special pinot noir glasses. She first had us sniff the wine in the large glass. On the website, the aroma is describe thus: “Our Pinot Noir opens with an alluring bouquet of dark berries & violets, leather & butterscotch.” It smelled good. Good nose, as they say. Next she poured some into the regular wine glass and had us take a whiff. Nothing. The scent was barely perceptible. Now she had us taste the pinot in the pinot glass. It had a pleasant flavour, rich and fruity. Then she had us taste it in the regular glass. It tasted bitter. Not pleasant. And so we were schooled in the art of drinking pinot noir. It needs to be served in a snifter so the aroma can reach the nose. And it needs to be drunk from this glass. She explained that the nature of the glass was such that the wine flowed to the back and center of the tongue, enhancing the flavour. If you drink it from a regular glass, the wine flow to the sides of the tongue, a different taste center. And the bouquet is not allowed to enhance the flavour. Both a nose and palate are needed to appreciate the full flavour. I have never been a fan of red wine. Maybe I should drink it in a different glass! 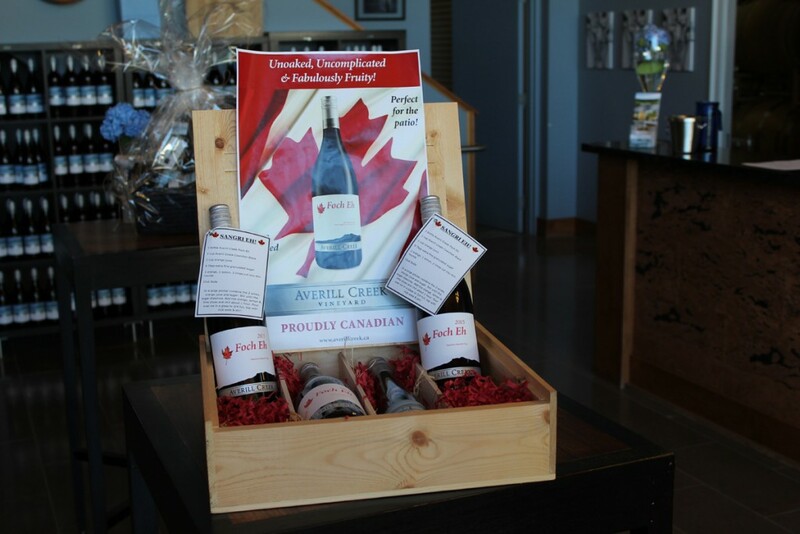 We were so impressed by Stephanie’s knowledge of wines and the wines we sampled that we bought some to take home. 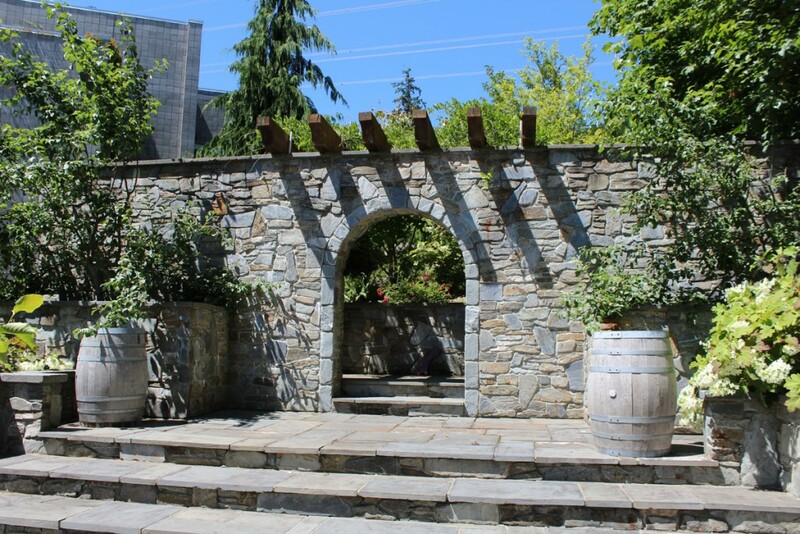 We bought some wine, including some to drink right away on their beautiful patio garden. A nice cheese platter added to the experience. Our table offered an excellent view of the valley below. 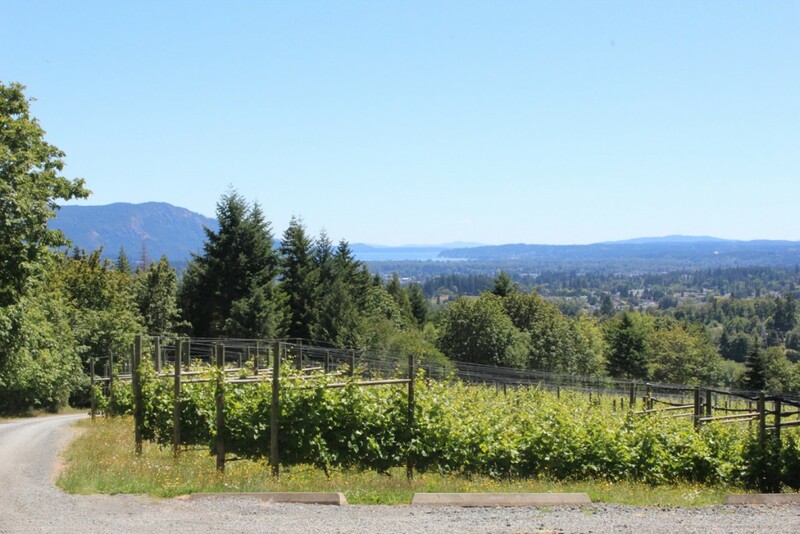 Looking out on the Cowichan Valley from the winery’s patio garden. 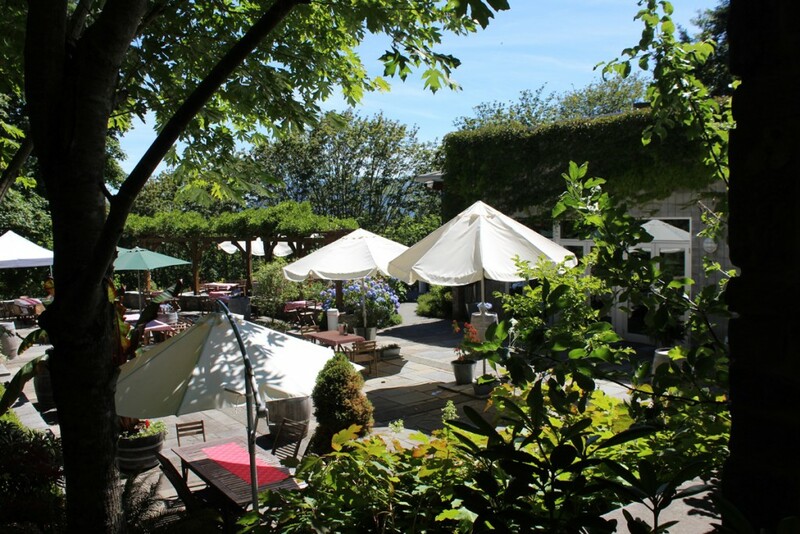 The patio had many planters in full bloom a well as bowers of flowers. 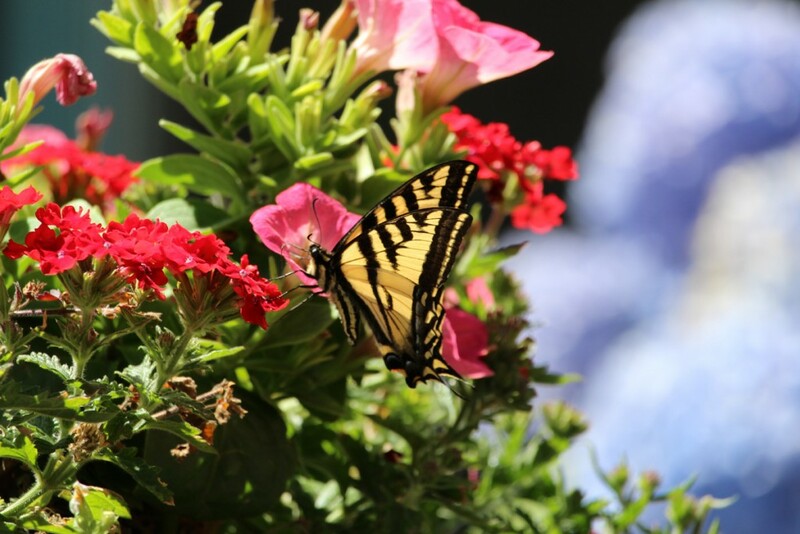 They attracted a good number of butterflies, adding to the charm of the place. 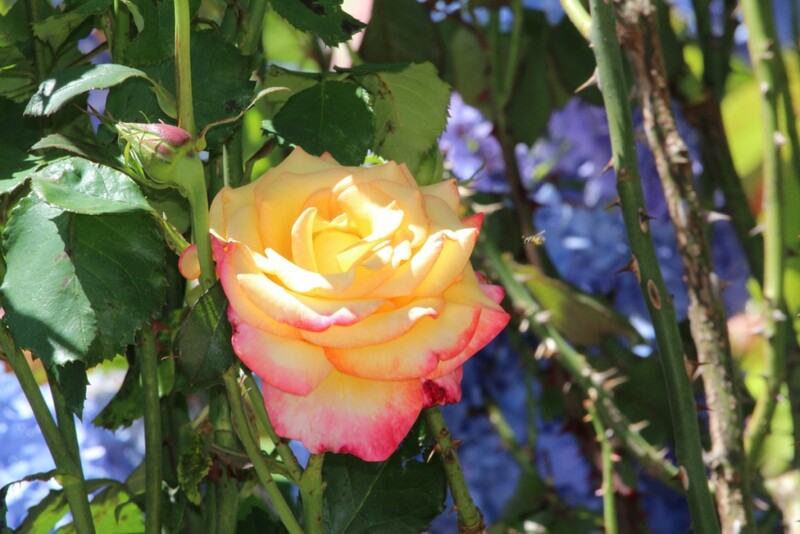 A beautiful rose in the patio garden. We enjoyed our little repast in the sunshine and then the friends we were visiting took us to the ferry for our trip home, glad we had made the stop at Averill Creek. I’ll end this post with some additional photographs of our visit. Janis and Sheila share a toast. The winery from the parking lot. 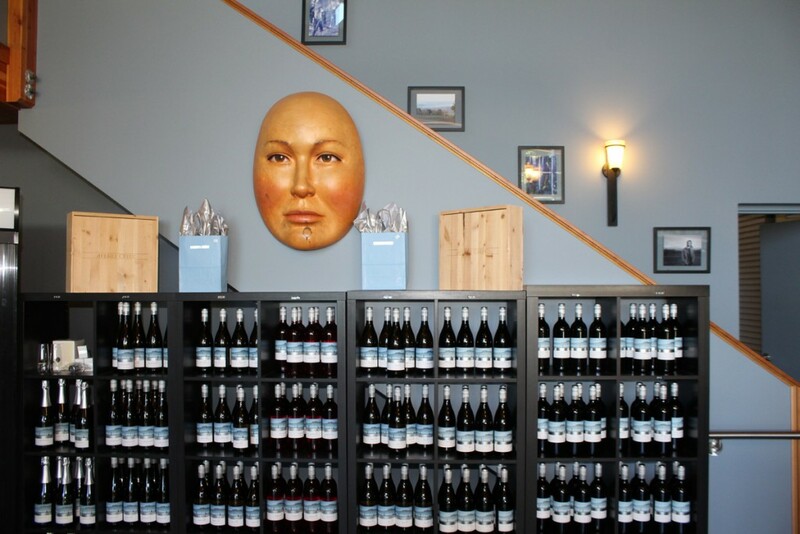 Racks of wine ready for sale. This kit includes the wines needed and a recipe for sangria. 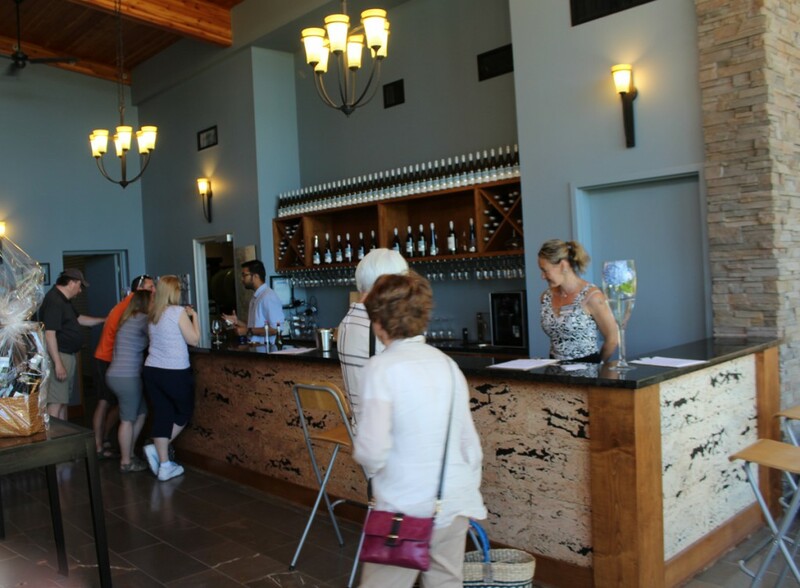 We saunter up to the bar for some serious wine tasting. 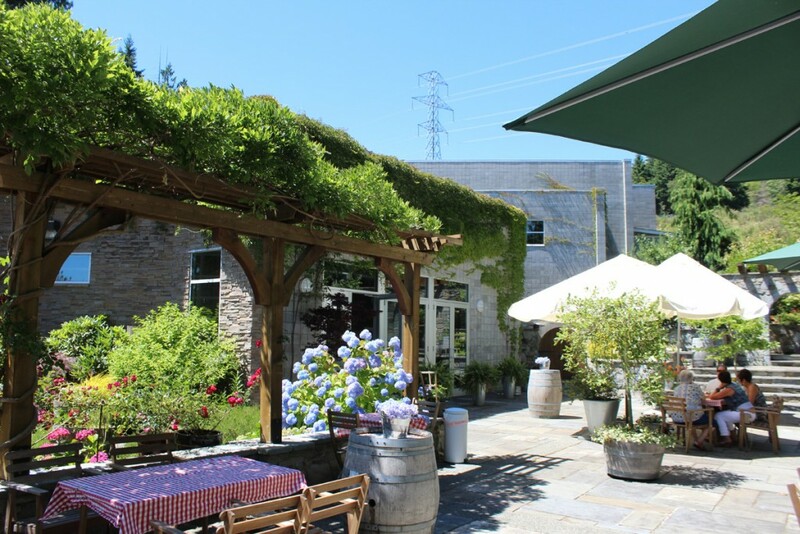 The three buildings of the winery seen from the patio. We thought this arch led to some more vineyards. Actually it’s a path to some washrooms.